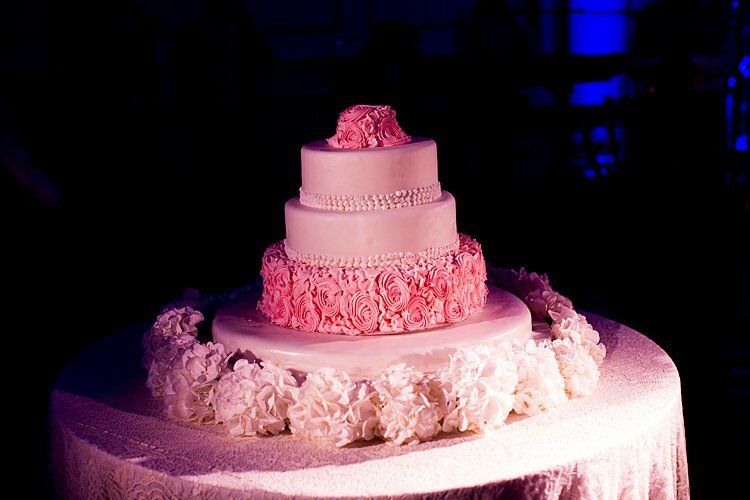 We always love seeing what wedding pros choose for their own big days. On one hand, they’ve got a leg up knowing all the ins and outs of the industry. 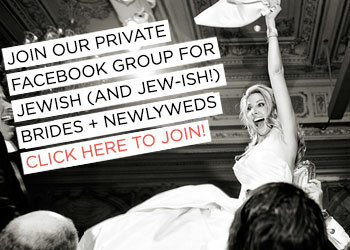 But on the other, when you’re surrounded by amazing wedding vendors day in and day out, how do you choose?! 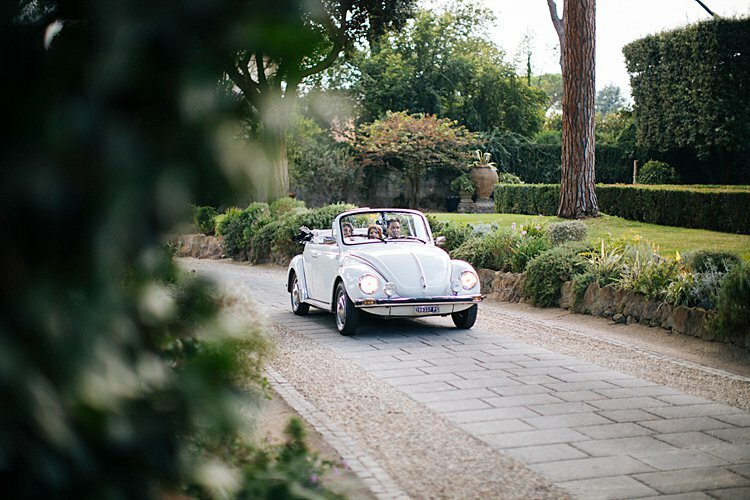 Today’s beautiful bride Laura is a London-based wedding planner, and we’re not surprised that she and Moshi, a financial adviser, picked a whole roster full of Smashing The Glass Recommended Vendors for their beautiful destination wedding in Rome: from ultra-creative videographer Denee Motion (love that drone footage!) 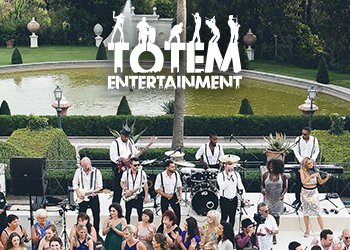 to a 10-piece band by the amazing Totem to a beautiful, colorful ketubah by artist Veronique Jonas from Ketubah.com, they went for some of the very best of the best. 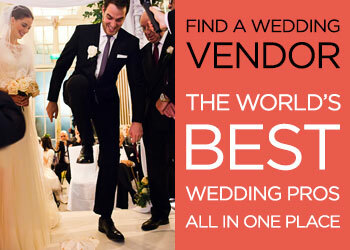 And then there’s Smashing The Glass Recommended Vendor Italian Wedding Company. 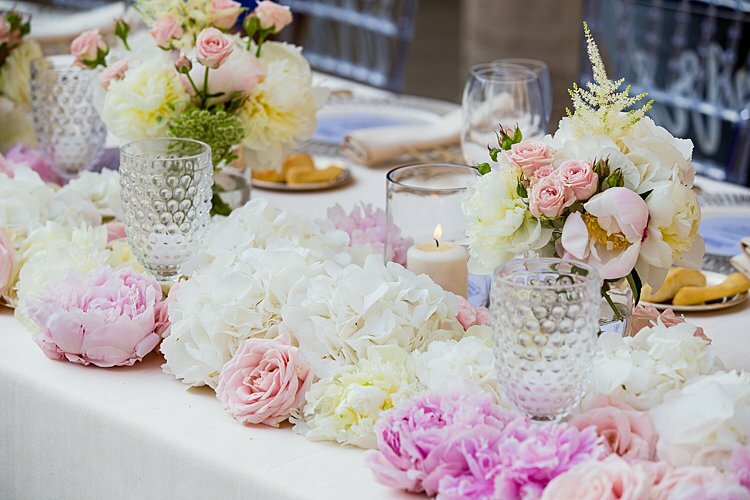 Being a planner’s planner is no easy job, but Stefania and Vanessa handled it with aplomb, helping Laura realize the wedding of her dreams despite her planning from abroad and speaking not a word of Italian. Photographer Paul Toeman captured all the emotion of the day — not to mention the gorgeous setting — so perfectly, and we can’t get enough of the couple’s adorable wedding hashtag, #moshandbecks. 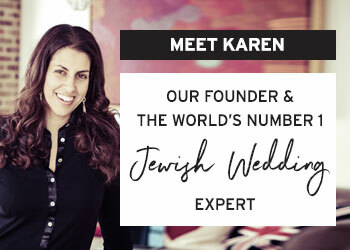 Laura, the bride: He was sitting next to a friend’s husband one year and asked who was sitting next to his wife. After cancelling what would have been our first date and re-connecting a year later, we met up and the rest is history! 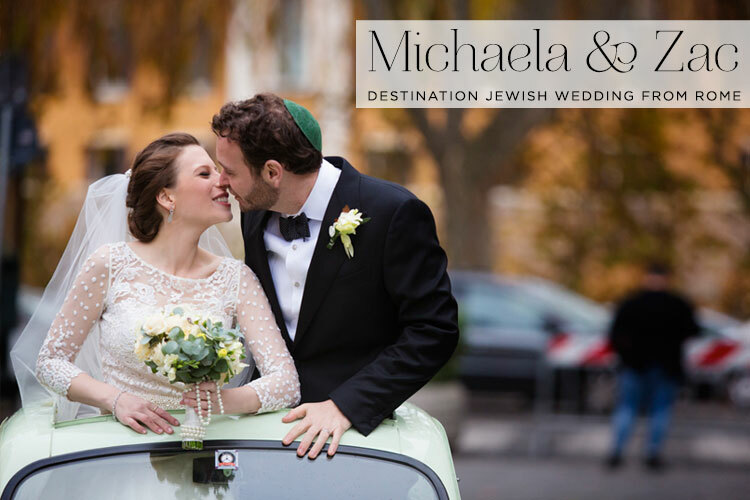 Where do you go for an uber-romantic Jewish destination wedding when you already live in the City of Love? 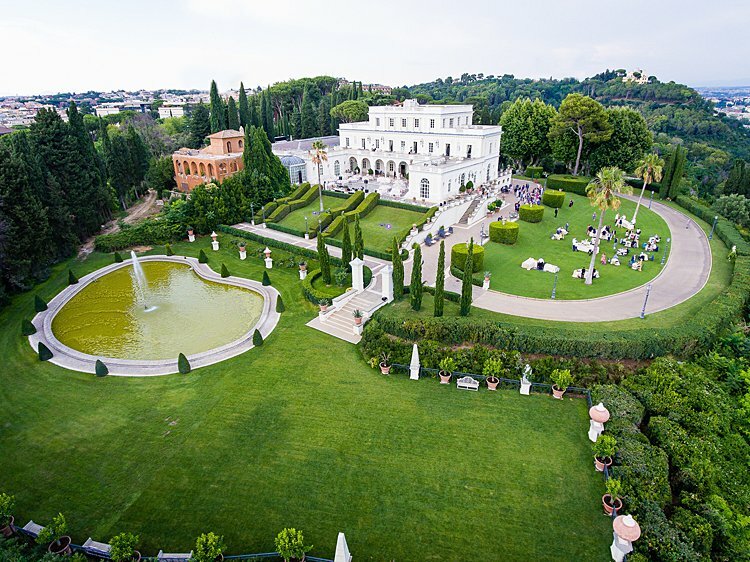 Paris-based couple Prescilla and Nathanael opted for Rome, with their ceremony held in the bastion of old-fashioned elegance that is the breathtaking Great Synagogue of Rome and their reception at the magnificent Villa Aurelia. 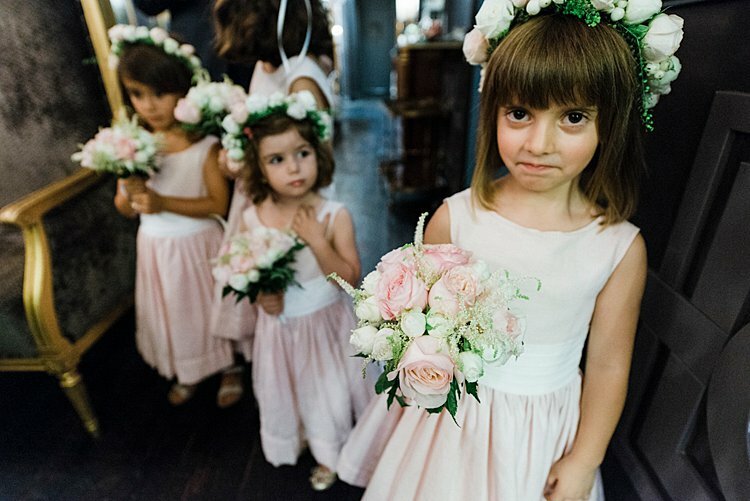 We are positively swooning over their fairy tale-perfect day. With mega-luxe florals in a soft, classic color scheme of white and pink and hundreds of candles hanging from trees on the grounds of the villa, the visuals of this wedding could not have been dreamier — check out photographer Framelines’ epic shot of the couple under a canopy of trees, lit only by the candles (at the very end of this post). Is that just the loveliest, or what? The couple, who are both doctors, can’t say enough in praise of their wedding planner, Elisa, from Smashing The Glass Recommended Vendor Le Ràªve. Elisa was recommended to Prescilla by a friend in Paris, and when the couple first met with her it was, as the bride says, “love at first sight.” Elisa connected the pair with their many fantastic vendors, and she helped them achieve the romantic look they were going for — and if you take a peek at the photos, and videographer Inesse’s beautiful capture of the day, we think you’ll agree she knocked it out of the ballpark. 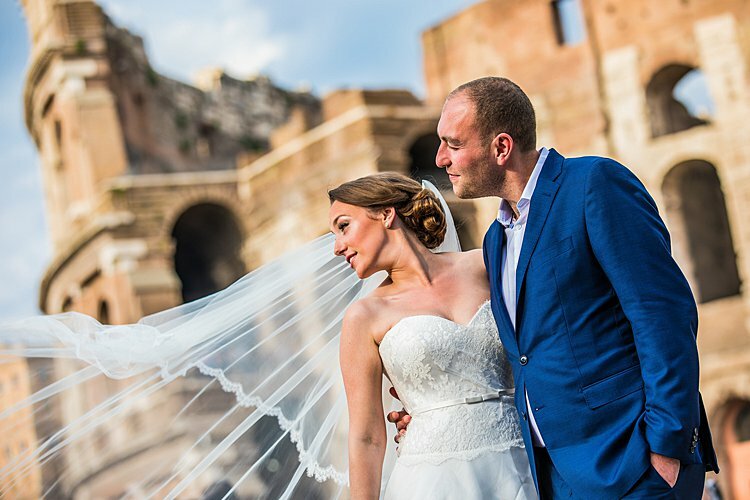 Prescilla, the bride: We got married in Rome, with a religious ceremony in the main synagogue and a great party in the magnificent Villa Aurelia. 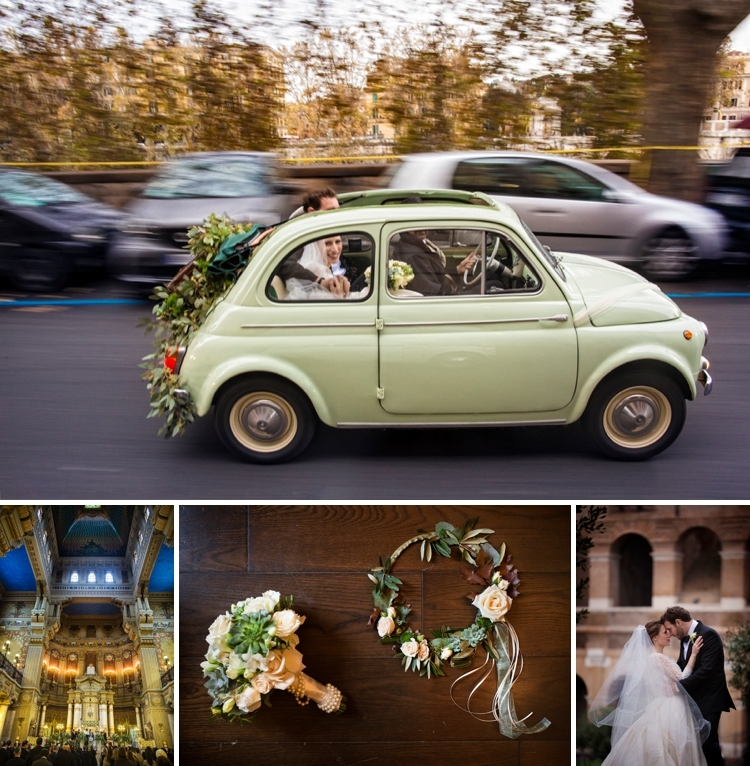 The extraordinary city of Rome was the inspiration behind Michaela and Zac’s regal, yet oh-so-fun, destination wedding with guests flying in from the UK, USA, Israel, South Africa, Zimbabwe, Australia, Hong Kong, Italy, and France, to share in the love for this gorgeous American couple. 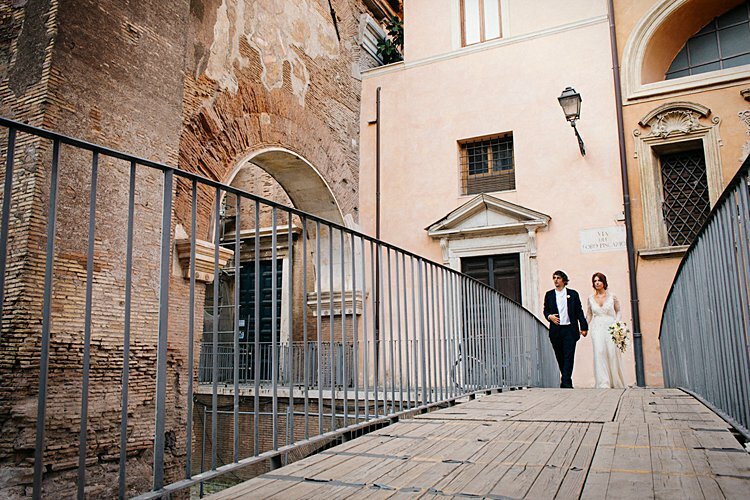 The magical city of Rome appealed to Michaela and Zac, not only because of the far-flung nature of their guest list, but also because they had their first official date in Rome in January 2010 — how wonderfully romantic! And I must just hero worship Michaela’s mum. She not only designed Michaela’s phenomenal gown, she also created the bridesmaids dresses AND an incredible surprise gift for Michaela – a custom made and beaded clutch that depicted the couple’s beagle, Loki. He’s a major part of their lives (he even has his own Facebook page) and they were so disappointed that he wasn’t able to be involved in their wedding, so this really was the perfect gift. What a mama! 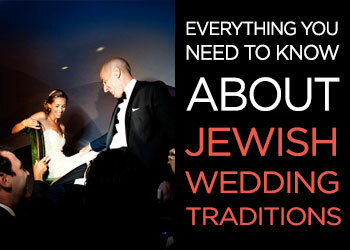 Thank you David Bastianoni for submitting this very special Jewish wedding packed full of personality. Every picture looks as though it’s from a fairytale and pitter patter doesn’t even begin to explain what my heart is doing right now… I hope you enjoy this wedding as much as I did. Liora and David met through their parents, when David’s family invited Liora and her family over for Friday night dinner. 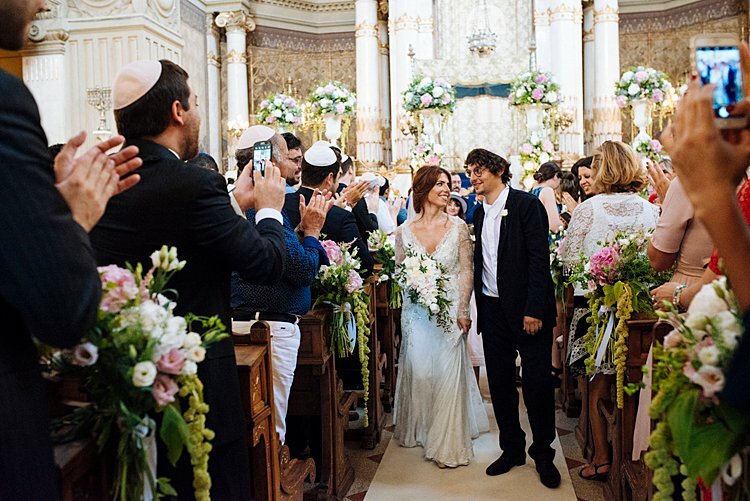 That sabbath meal led to romance and an even more romantic wedding in Italy. 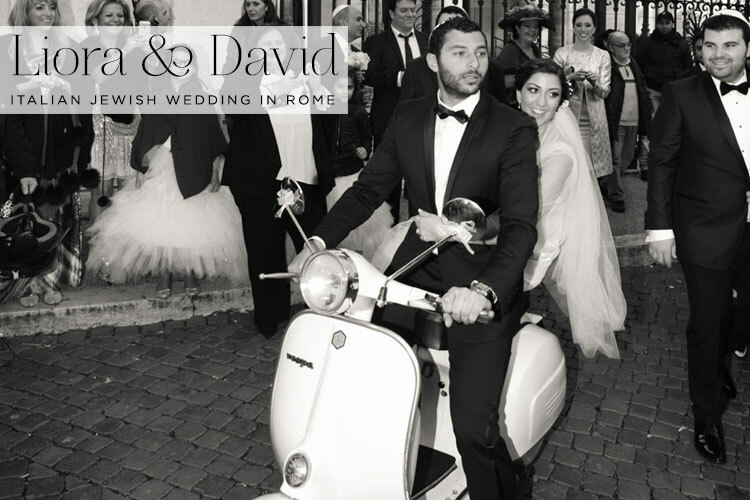 The magical city of Rome provided the inspiration for Liora and David’s chic destination wedding and there are some really wonderful touches. 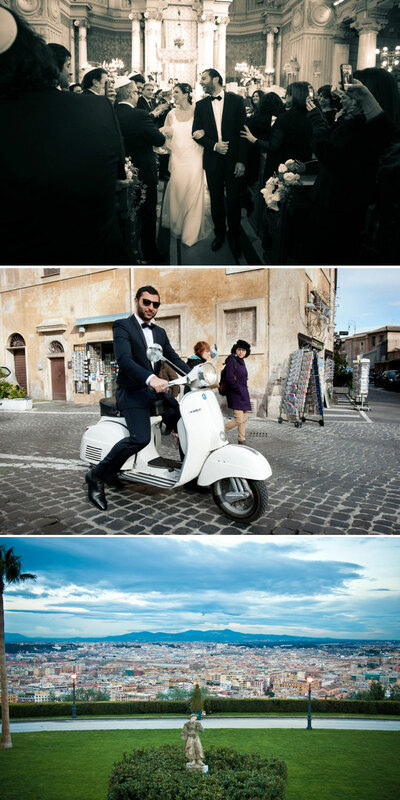 Take the Italian vespa for their wedding transport, a smorgasbord of Italian desserts instead of wedding cake (hello, lashings of tiramisu), and the choir of the Great Synagogue of Rome providing the music for their ceremony. Oh my! Mr STG and I traveled to Italy for our honeymoon and it really is one of the most gorgeous places on earth. The landscape, the buildings — what an amazing place to be married. 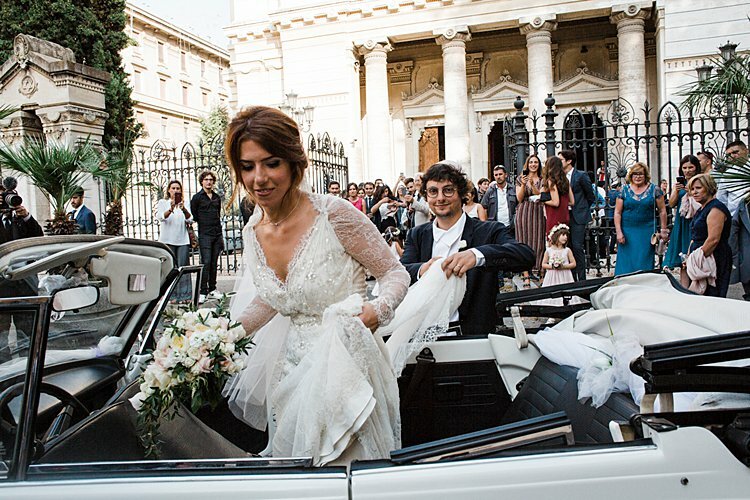 Liora and David held their ceremony at the breathtaking Great Synagogue of Rome followed by a BIG party at Villa Miani with breathtaking 360 ° views over the Rome skyline(and can we all just take a moment to appreciate their entrance song — the super fun A Far l’Amore featured in Paolo Sorrentino’s movie, The Great Beauty, set in Rome). The whole affair was beautifully planned by our much loved Smashing Supplier, Stefania Zen from the Italian Wedding Company. 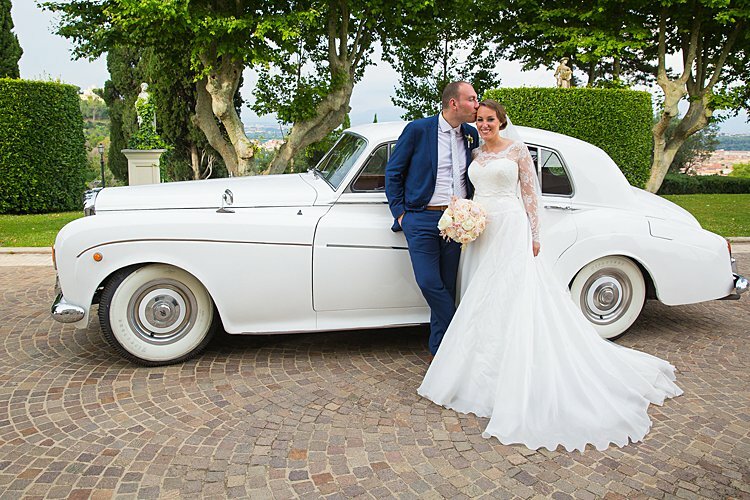 Liora says that Stefania was literally her right arm throughout the planning process, and knowing how wonderful the Italian Wedding Company are, I can very much vouch for that. Big thanks also to Vinicio Ferri and Alessandro Zingone for the wonderful photos.